Rosana Castrillo Díaz’s two contributions to this group exhibition use the base concept of drawing—pencil marks on a flat surface—but they’re scarcely visible. In fact, I didn’t even notice them in my first few circles around the gallery. 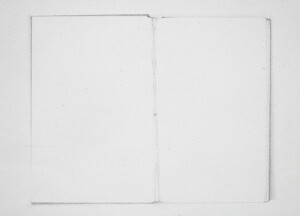 Her untitled works (both 2005), which are pale, modest graphite sketches drawn directly on the wall, depict cropped fragments of books: a few words, an open page, the edges of a clothbound cover. These drawings signal, indirectly, the disappearing relevance of traditional media when confronting the wall as decorative surface. Not satisfied to present the wall as either a “canvas” or a support on which to hang pictures, the assistant curator Katherine Carl selected seven artists from the Drawing Center’s Viewing Program for Wall-to-Wall Drawings: Selections Summer 2005. The works on view attempt to redefine the medium itself while pushing ideas about wall drawing to new extremes. This twofold process is no easy task, as artists have confronted the wall for hundreds of years (in cave paintings, Pompeii homes, Renaissance frescos, Mexican murals, and, more recently, the work of Sol LeWitt, Chitra Ganesh, and Nicole Eisenmann). 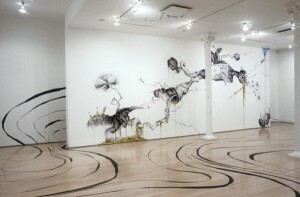 While a few artists tow a more conventional line, others fully expand the forms contemporary wall drawing can take. Like Díaz, Shoshana Dentz applies her mediums directly to the wall but approaches it conceptually as a physical means to divide space. The immense size of the fence posts and horizontal planks of Fence II #46 (2005), executed in gouache, graphite, and acrylic ground, gives the viewer a discomforting sense of enclosure and confinement. Two of the more challenging works on view allude to Minimal and Conceptual art, using cuts made with X-acto blades or power tools to define the space a drawn contour once did. Avantika Bawa’s (un)fragmented spaces (2005) is comprised of hybrid objects built mostly with irregularly shaped pieces of cardboard and Styrofoam (but also graphite and latex); mounted on the wall, they frame a door jamb in the gallery and meet at the convex right angle where two walls meet. Her work’s neutral light-gray color recalls that of Robert Morris’s early sculptures of painted plywood. And like Morris’s investigations into the phenomenology art experience, Bawa’s work creates a dialogue between the work and its site and blurs the boundaries of drawing, sculpture, and architecture. In 1967, Lawrence Weiner removed a three-foot-square chunk of plaster from a gallery wall as institutional critique; many artists since have recycled such conceptual tactics. In Mind and Body (2005), Chris Sauter follows suit but with an added poetic intent. The artist extracted circles of various diameters from the Drawing Center’s drywall and then assembled a life-size telescope and tripod with these freed round bits. 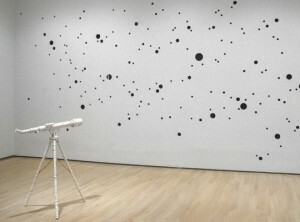 By pointing this object back to the wall, which now resembles a starry sky, Sauter seems to say that the quest for knowledge is not always a physical experience. A couple of works, though admirable on their own, stray somewhat from the curatorial theme of redefinition of medium and support. 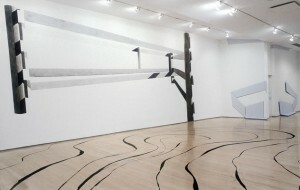 For Drawing ON The Drawing Center (2005), Sun K. Kwak stuck black masking tape in graceful, sweeping curves across the gallery floor. Although the tape adheres to the gallery walls in several places, the artist seems to be responding more to the architectural space as a whole—including the floor, ceiling, support pillars, and other elements—while the wall itself remains peripheral. Executed in ink and spanning a huge wall, Mark Licari’s Untitled (2005) presents a fantastical scene of busybody anteaters managing a bizarre contraption that looks like a mechanical digestive system. Despite its wow factor—the bright colors and comical figures are a delight to follow across the wall—the work corresponds too closely to the kind of traditional wall drawing the exhibition aims to transcend. Surprisingly, Charbel Ackermann is the only artist who engages digital technology. He builds on the eerie coincidence that the so-called Axis of Evil is an actual straight line that, when plotted on a flat map, has crucial points not only on Pyongyang, Tehran, and Baghdad, but also on Havana. The New Geometry (2002–3) is a droll instructional PowerPoint presentation—watercolor and ink drawings have been digitized and overlaid with typeface and charts—that depicts the artist’s discoveries, from the entirely rational (key cities in Syria, Libya, and Afghanistan also appear on the axis) to the uncannily absurd (when Leonardo da Vinci’s Vitruvius Man is centered on the axis, his Achilles heel touches New York). 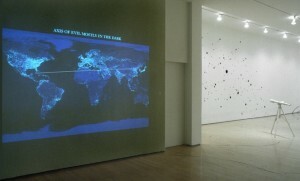 The wall, in this case, becomes simply a screen for projection. Overall, Wall-to-Wall Drawings assembles an exceptional collection of work by emerging artists that, for the most part, thoroughly challenges traditional ideas of wall drawing. The most successful pieces address the subject both conceptually and perceptually and pass their discoveries to the viewer. Originally published in the Brooklyn Rail in July–August 2005.